Federal Highway Administrator Victor M. Mendez' busy schedule is jam-packed with meetings with White House, DOT, and FHWA officials, Governors, Mayors, a middle school student from Washington State, Members of Congress, industry trade groups, and many others. Back row, left to right: Julieanna Purdue, Craig Barnes (Heni's Father), and Walter Purdue (Heni's student advisor). Front row, left to right: Administrator Victor Mendez, Heni Barnes, and FHWA's Richard Weingroff. 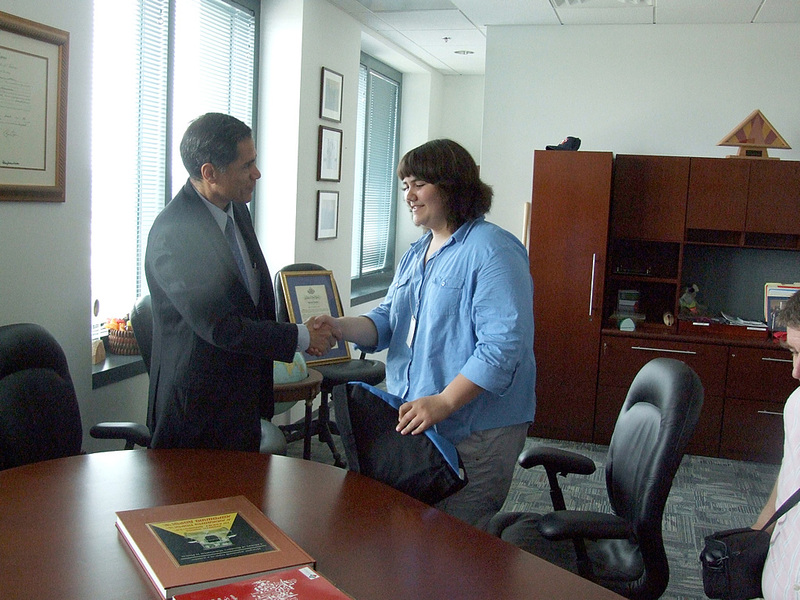 On June 16, the Administrator met with Heni Barnes of Coupeville Middle School who had come to DOT Headquarters while in the area for the National History Day competition in College Park, Maryland. 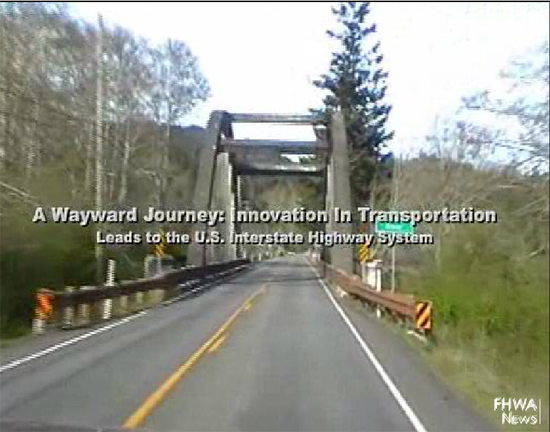 As her entry, Heni had created a documentary called "A Wayward Journey: Innovation in Transportation Leads to the U.S. Interstate Highway System." In addition to her extensive readings on the subject, she had interviewed FHWA Washington Division Administrator Dan Mathis in Olympia, and Richard F. Weingroff of the Office of Infrastructure. When Richard, FHWA's "unofficial historian," mentioned to the Administrator that Heni would be stopping by to drop off a copy of her documentary, he said he would like to meet her. The Kenneth E. Behring National History Day is a nationwide competition in which students at different grade levels compete statewide and nationally. Each year, a new theme is chosen. For the 2009-2010 school year, the theme was "Innovation in History: Impact and Change." The students selected their topics, did the research, conducted interviews, prepared the final projects, and defended them to reviewers during State competitions. State winners moved on to the University of Maryland where they competed in June with students from across the country. Heni is one of several students FHWA has helped with projects in the National History Day competition over the years. 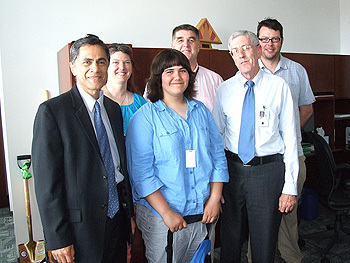 In 2004, for example, Richard joined with Secretary of Transportation Norman Y. Mineta to help three students from Bakersfield, California, with their project on historic U.S. Route 66, a route the former Secretary had traveled by car when he was growing up (see https://www.fhwa.dot.gov/infrastructure/nhd.cfm). Christoper Crinkleton of Northern Middle School and Richard Weingroff, FHWA's "unofficial" historian. The Interstate has had an enormous impact on local and national economies as well as Americans' quality of life. In fact, it is difficult to quantify all the ways that the Interstate has affected our lives. Perhaps that is why today many Americans feel indifferent towards it. 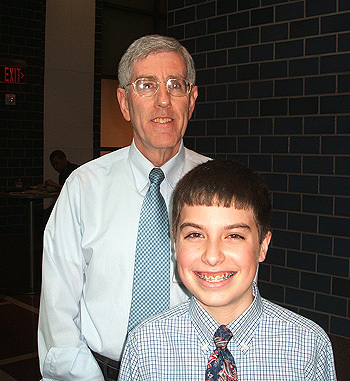 In addition to extensive reading on his topic, Christopher interviewed Richard on digital video last November about the history of the Interstate System and how it has affected our lives. "One thing I have found," Richard said, "is that Heni, Christopher, and the other students I've helped over the years have really done their research. They devoted many hours to their project-reading, interviewing, and pulling all this information together for their final product. They showed tremendous initiative, creativity, and critical thinking." 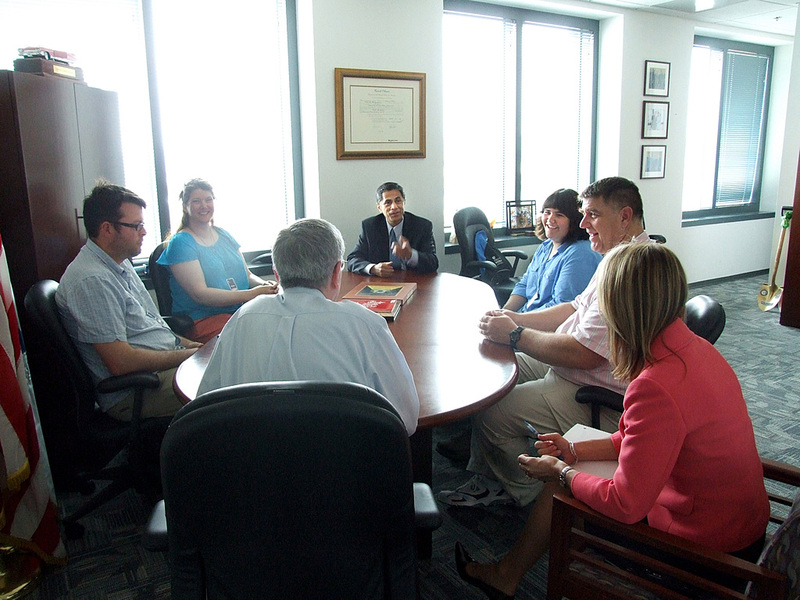 On June 16, Heni, her father Craig Barnes, her student advisor Walter Purdue, and his wife Julianne met with Administrator Victor Mendez in his office. Heni explained how she decided to pick the Interstate System as her topic. Her family was driving from their home to visit family in Oregon. She noticed the change from the smooth fast I-5 to the slow bumpy non-Interstates. That got her thinking about what driving used to be like. She told the Administrator that after she chose her topic, she began talking with older family members about their experiences, calling government officials, going to libraries, and checking Web sites. She interviewed Dan Mathis on camera in his Olympia office and recorded her telephone interview with Richard. Victor told Heni that he appreciated the theme of innovation because it is at the core of his work and had resulted in his Every Day Counts initiative. They also talked about the impact of the big Interstates on towns along the old roads they replaced as well as the importance of highway safety. In the 2010 national competition, Heni was one of the medal winners for Junior Individual Documentary, while Christopher won a medal for Junior Web Site. After meeting Heni and Christopher, Richard said, "I was happy to help them, but their success is because of their hard work, commitment, and resourcefulness." The future of democracy depends on an inspired, thoughtful, and informed citizenry. Historical understanding is crucial to that process. National History Day teaches essential historical literacy that motivates students to secure the future of democracy. Oral and written communication and presentation skills. A sense of responsibility for, and involvement in, the democratic process.